Click on Applications from the left-hand column of the iTunes window. Locate the application and either right-click or Control-click and choose Delete from the shortcut menu. 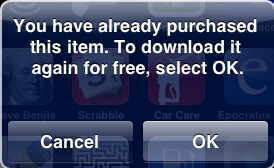 Select Remove when asked if you want to remove the selected application from your iTunes library. Select Move to Trash when asked if you want to move the selected application to the Trash or Recycle Bin. Go to the App Store on your device or in iTunes. You will then see a dialog similar to one of the two below.